Text source: Copyright © Cambodia Research Network. Click to email CRN inquires and corrections. Used with permission. 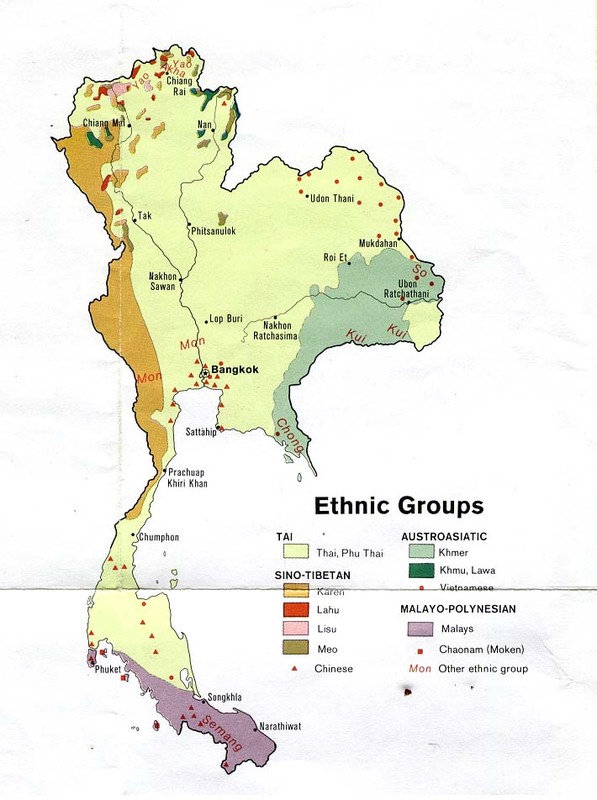 There are six small people groups in Cambodia which are linguistically related: the Chong, the Por (Peur, Pear), the Samre, the Saoch, the Somray and the Suoy (Suy).These groups are both linguistically and ethnically distinct from the Khmer majority. Together they total less than 10,000, with some of the groups numbering just a few hundred. 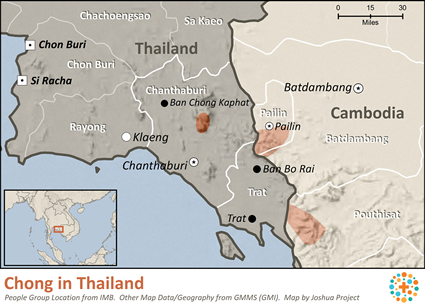 The Chong people are also found in Trat and Chantaburi Provinces in Thailand. Historically, they were early inhabitants of Cambodia and probably pre-dated the Khmers. During the Angkor period it is quite likely that some of these groups served as slaves. They were also known as cultivators and gatherers of cardamom. The Khmer Rouge severely persecuted some of these groups. Some lost their traditional lands during the decades of conflict. Presently they are scattered in pockets west of the Mekong River. Most also speak the national language, Khmer, and are becoming increasingly assimilated into Cambodian society. Many younger people from these groups now use only Khmer. In some cases only a few elderly people still speak the language. It is likely that in a generation these unwritten languages will become extinct. Information about these groups is very limited. A recent survey trip for the Chong failed to find any people from that group. Although there are historical references to them, they may no longer be present in Cambodia. They live in small, remote, isolated villages that are often located in heavily forested areas. Mostly they practice subsistence rice farming. Their fields are usually some distance away in the forest and every couple of years or so they will move them. They are very dependent on the monsoon rains and in flood or drought they will face food shortages. They also grow a few vegetables and bananas, and gather forest products such as resin, firewood and charcoal. Some still live in the Cardamom mountains and collect cardamom from the forest. They mostly live in humble, short stilted, one room houses with the roofs made from leaves and walls made from leaves, bamboo and occasionally wood. They dress similarly to rural Khmers which is basically western style. Most are non-literate. Educational opportunities are quite limited and conducted in the national language, Khmer. The Pearic people are primarily animistic. They worship Neak Ta or Arak whom they believe are powerful spirits which can harm them and require sacrifices to appease them. They often practice traditional medicine which is a mixture of spiritism and the use of medicinal plants gathered from the forest. However, most of these practices are not helpful and some are even harmful. They are very superstitious and live in great fear of the spirits. For example, those who live next to the Cardamom forest have very specific "rules" about how they must behave while collecting cardamom in the forest. 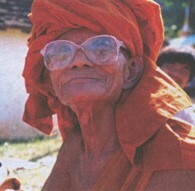 They are extremely poor and looked down upon by the Khmer majority. They lack access to education and health care. They most importantly need someone who will take them the Good News. View Chong in all countries. Location in Country: Chanthaburi province: Khao Khitchakut district, 4 villages; Trat province.